AN ongoing dispute between US airline giant Boeing and Canadian firm Bombardier – who have a plant in Belfast – will be discussed by MPs later today (Wednesday). Boeing officials will be questioned by MPs before giving evidence to a House of Commons committee. The trade row is threatening up to 1,000 jobs in Belfast, after allegations that Bombardier received subsidies allowing it to sell its C-Series planes at below-market prices in the US. Bombardier has received unanimous support here politically, with DUP leader Arlene Foster and Sinn Féin leader in the north Michelle O’Neill attempting to intervene amid the ongoing dispute. Antrim and Newtownabbey Borough councillors also passed a motion urging the Council to write to Prime Minister Theresa May in an attempt to save jobs. 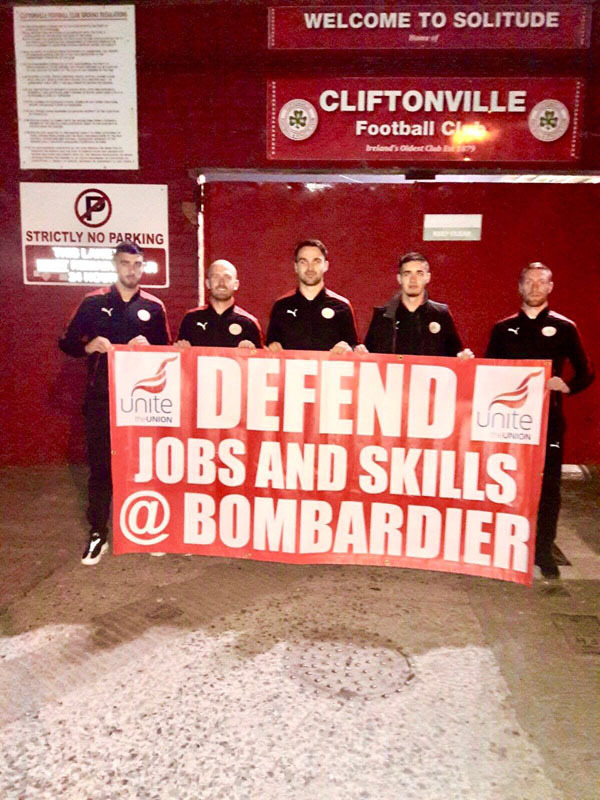 North Belfast football rivals Cliftonville and Crusaders also put on a public show of support with players holding a banner ‘Defend Jobs and Skills at Bombardier’ before their County Antrim Shield clash in October.